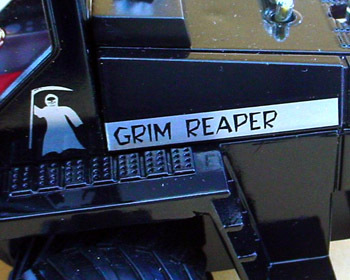 The inspiration for my Grim Reaper came from Dave Marek’s artwork of the same name. After it was posted on the Showrod site I started thinking about building it. 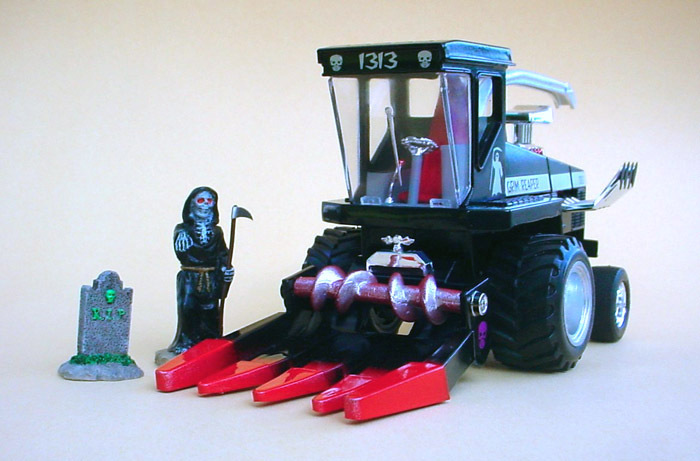 I started by looking for a 1 /25 scale combine but soon found the only ones were die cast metal and were HUGE! I put the project on the back burner for a while, still looking for something to start with. 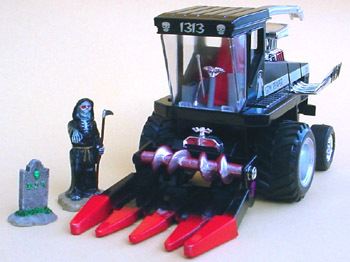 While looking through the toy section at a local store I found a 1/32 scale plastic combine. I bought it and took it home. After getting it home I found it was still too big for what I wanted. But included in the box was a small catalog with the other farm equipment from NewRay. There it was a small combine with lines a little more like the Marek drawing. I hunted for the small combine for a while before the local store got a bunch of new toys in. Again I bought this new smaller combine and went home. The toy is put together with screws and tabs so I was able to take it apart with little problem. I then started separating the parts into piles I could and could not use. I added front tires from some other monster 4X4 toy truck, a gasser axle from the AMT 69 Mustang, rear tires from the parts box (ARII wagon wheels with BFG’s ), a engine and exhaust from a Groovy Grader and grille and seat from a Pie Wagon. I started by fitting the Grader engine into the back of the combine, I cut openings for the blower and exhaust. The Mustang gasser axle became the Reapers new rear axle. 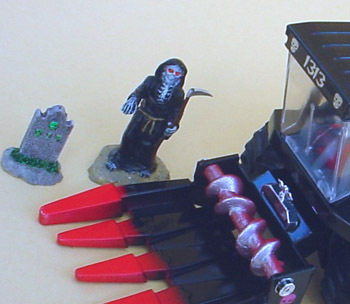 The crude one piece interior was tossed and a new one was made from sheet plastic, Pie Wagon seat and a chain steering wheel from a low rider kit. Custom decals were made for the ‘dash’ on each side of the seat. The grille from Pie Wagon was cut down and fitted to the combines front. 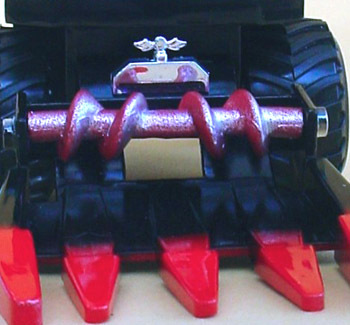 The molded in pea green plastic was primed with Tamiya white and then the ‘forks’ were painted Tamiya bright red. 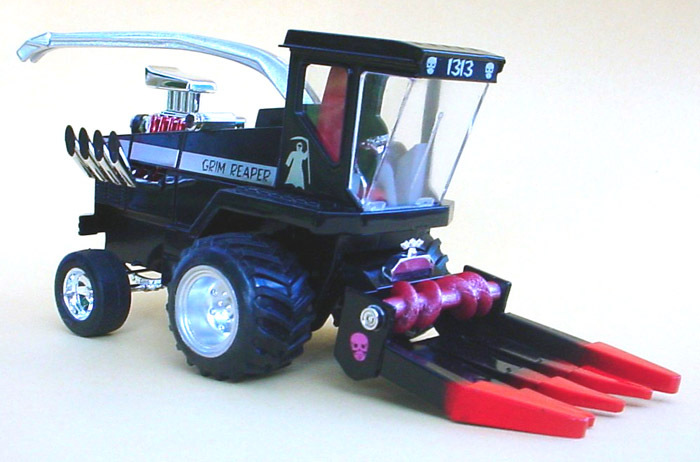 After this dried I painted the rest of the combine with Tamiya black. Custom decals were then added. 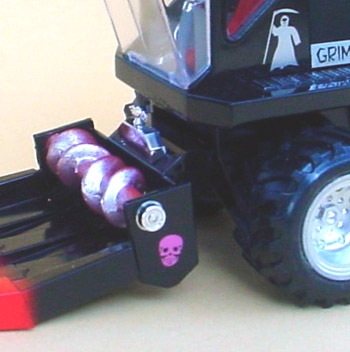 Skulls, ‘Grim Reaper’ and 1313 logo’s were added to complete the Grim Reaper. I found a Reaper figure and tombstone with some Halloween decorations at a craft store. While its not a exact model of Dave’s ‘Reaper’, I didn’t want it to be, It does have the same flavor. The 1/32 scale body worked really well as a 1 /25 scale showrod. This is the same trick Tom Daniel used on a number of his creations so I felt I was in good company! !